The Core Memory Pillows are designed to help stabilize an existing condition and provide comfort for special sleeping needs. 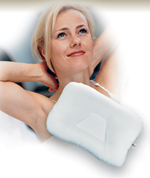 Made of 100 percent viscoelastic foam, these support pillows respond to the heat of your body to better conform to the unique shape of your head and neck. Includes a washable, plush fabric cover. Fits a standard pillowcase. Available in Full-size (14 in x 19.5 in, Lobes 4 in and 5 in) and Mid-size(12 in x 19.5 in, Lobes 3 in and 4 in).